Perfect Vous utilizes Dermaquest one of the finest professional quality skincare products, product line is available in our salon. The Essentials Collection delivers the nourishment, protection and balance that your skin deserves. Brimming with vital enzymes, vitamins, minerals and nutrients, these core products will revitalize any skin type and effectively prepare your skin to address specific concerns. These products are utilized during our professional treatments are also available for in-home use. This kit contains comprehensive blends of high performance ingredients such as powerful antioxidants and botanical plant stem cells designed to balance, hydrate, strengthen and protect the skin. This regimen helps your skin reach its fullest potential by improving your skins’ natural balance and establishing a vibrant healthy glow. C-Infusion Serum boasts an acid-free exfoliation complex to gently shed dead skin cells without causing irritation. It brightens and improves the structure of your skin by increasing firmness as it promotes and protects collagen and elastin proteins. This remarkable broad-spectrum chemical sunscreen shields vulnerable skin from the harmful effects of the sun. Botanical plant extracts, peptides and antioxidants help to firm and plump, restoring sumptuous, silky energy to your skin. The DermaQuest skin journey starts by restoring and balancing all skin. The integrity of skin is fundamental to all medical skin care programs. A dehydrated, irritated skin can often react to strong ingredients. Therefore DermaQuest will commence an “essential skin health” program for all. Once micro cracks are fully restored, and your skin is in balance, then the pathway into more active ingredients can begin. 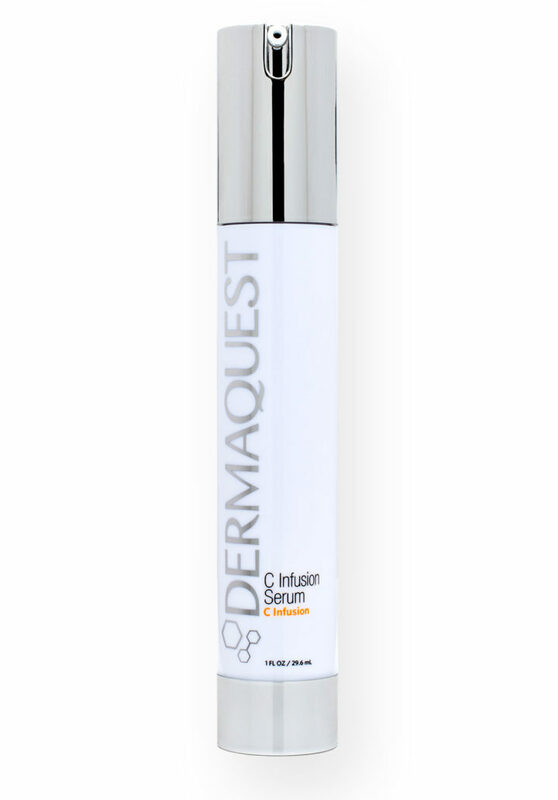 DermaQuest’s cosmeceutical collections provide luxury care, rich in botanical stem cells, peptides and vitamins. Our products and sequences do so much more than soften and pamper your skin. While proper cleansing, hydration, strengthening and protection is the best program for all skin, at DermaQuest we strive to achieve “maximum skin health” for all. We address all skin conditions and achieve results through our advanced treatment peels. The rewards of healthy, transformed and nourished skin are not only attainable, they are sustainable. Our philosophy delivers stunning, long-term results. Your skin deserves to be loved! B3 Serum is free of commonly used heavy silicones that sit on the skin preventing absorption. Instead, B3 serum dissipates into the skin to firm, hydrate and support barrier repair. An unrivaled blend of antioxidants to target unwanted discoloration and environmental damage, perfect for anti-aging and prevention! Stem Cell 3D Complex is crafted with botanical stem cells to help rejuvenate and protect the skin. The potent peptides promote skin firmness and smoothness, while antioxidants help scavenge free radicals in the skin to reduce the appearance of fine lines and wrinkles. Edelweiss, Jasmine and Gardenia Stem Cells rejuvenate skin, harnessing fine lines and wrinkles and energizes, brightens and tightens. Stem Cell 3D Tinted Moisturizer lusciously builds and promotes hydration.